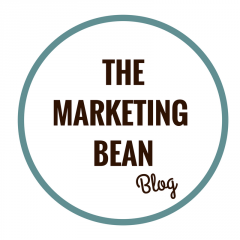 Marketing does not stop changing – ever. In fact, I cannot remember a time I didn’t have to learn new systems, theory, frameworks and ways of doing things throughout my career. I think that is why I enjoy it so much. However, constant change also means that it is very easy to make mistakes! I can assure you that I have made a few of those over the last decade. This is not necessarily a bad thing, after all who learned anything by not making mistakes? 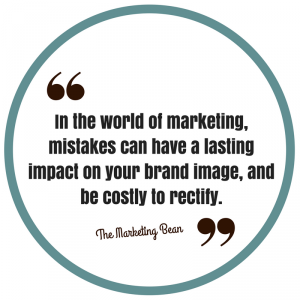 But in the world of marketing, mistakes can have a lasting impact on your brand image, and be costly to rectify. Yep, you’re probably thinking ‘here she goes again…’ but I cannot stress how important this is! My favourite example of this was a recent #marketingfail by The National Trust. They removed all advertising from popular site Mumsnet due to swearing. Big pat on the back for not understanding your audience because, shock horror, Mums do actually swear (a lot in my case). They have clearly built their brand strategy around a persona that does not exist; the idealistic mother. Yes, even BIG brands get this very wrong. So how can you avoid it? Simply get to know who you are marketing to. If your product or service appeals to several audiences, then make sure your marketing is tailored to each of these ‘segments’. Without planning how can you understand where you are going? How can you measure your success? How do you what your marketing will cost? A plan does not have to be complex, but simply outline where you are and how you are going to achieve your goals through your marketing activities. I know an awful lot of local businesses that work on a ‘responsive’ basis when it comes to marketing. Being proactive can be far more beneficial to support your business growth strategy. Yes, planning is not much fun! But it will help you immensely. You will thank yourself in a years’ time when you can look back and see what you have achieved. “Let’s just put an advert in the local paper”, yeah great idea – but why? Are you trying to increase brand exposure, promote an event, sell a product, drive traffic to your social media platforms? (I could go on…). Every activity you pursue as part of your marketing should have a purpose and a required outcome. This applies to every type of activity, online and offline. For those of you utilising social media platforms, just think before you hit the ‘post’ button, consider ‘what am I trying to achieve?’. You do not have to post on your social media pages every day – quality over quantity! Now do not get me wrong, there are engagement strategies which produce faster results than others. However, expecting an overnight return on investment is simply ridiculous. Particularly in the world of digital, elements such as SEO focus on tactical (short-term) activities with the aim of strategic (long-term) search engine optimisation. “But I completed my metadata last week and I’m still not ranking” – hell no, you’re not. That’s because it takes months to see any results (don’t believe me, check out this great report by Ahrefs). If you want instant results through your marketing campaigns, I suggest you consider tactics such as direct engagement through offline strategies, offers, promotions and online paid advertising. “But everyone else is on Instagram!” The question you need to ask is why are they on Instagram and is it beneficial for your business? Adding an additional social media platform into the mix needs careful consideration. Are your target audience prevalent on there? Have you got time to update it regularly? What are you going to post? The same goes for all marketing, if you genuinely believe something will add value then go ahead. Just doing it because ‘everyone else is’ is the wrong approach. As I always say; go where your customers are. If you don’t measure your marketing, how will you know it is working?By measurements, I don’t mean running pages of meaningless statistics – just the information that really means something and tells you what you are doing right, and wrong. Online measurement needs no explanation – you will find a wide range of free measurement tools (this will have to be another blog!) and analytics software. Offline the use of vouchers, customer surveys and discount codes are great to help you measure your marketing effectiveness. Not many businesses take this seriously, but how can you differentiate yourself without fully understanding the competition? You can get a huge amount of information about your competitors online, but a very under-utilised way of getting information is through your customers. There must be a reason they chose you over your competition? Talk to them and see what they say. Ultimately, price is a key driver in the decision making process; how do you match-up to your competitors? What is their customer experience like? If you do not currently follow your competition, you are missing a BIG trick. So every week you find and create content, schedule your social media posts, book your weekly newspaper ad space, sort your voucher promos…that’s your marketing all done, right? No – it sounds like you are stuck in a marketing rut, this is the time to revise your strategy. Stepping outside your comfort zone might return some surprising, and rather excellent results! Okay, so you have convinced yourself that your weekly marketing ritual works – however, you might be missing a golden opportunity elsewhere. Schedule a change into your marketing activities and monitor the results, if you do not try you will never know. So there we have it. I can think of plenty more to add to the list, but maybe we should tackle those in another post. Finally, I will reaffirm; no one is perfect and you WILL make mistakes!